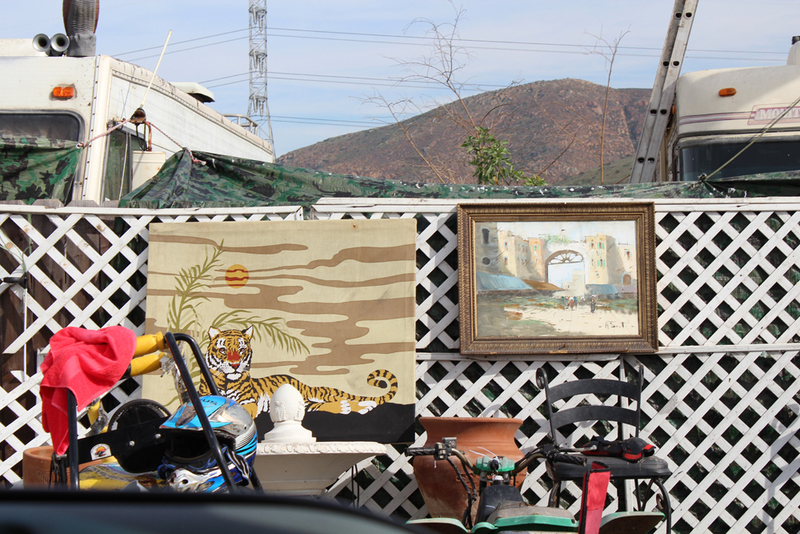 29% of the San Ysidro student population is homeless, often living in motels and junkyards. Reposted for Homeless Awareness Day. Veronica Medina went from being an A student to an F student while at San Ysidro Middle School. It was right around the time that her parents split up. Her dad moved to Tijuana and her mom became addicted to drugs. Medina spent many nights and weekends alone in an apartment, not knowing where her mother might be. At one point, her mother couldn’t pay rent and they ended up in a hotel. For two years, Medina bounced back and forth between couch surfing with her mother and living with her grandmother. That was back in the 1980s. For the last nine years, Medina has been the homeless liaison for approximately 1,408 students, or 29% of the 4,832 total enrolled in the San Ysidro School District, the largest student homeless population percentage-wise in the entire county. Her title has changed over the years— she is now the Student & Family Services Manager—but her work has never changed. She also actively solicits donations from community members, businesses and organizations for food, clothing and school supplies. 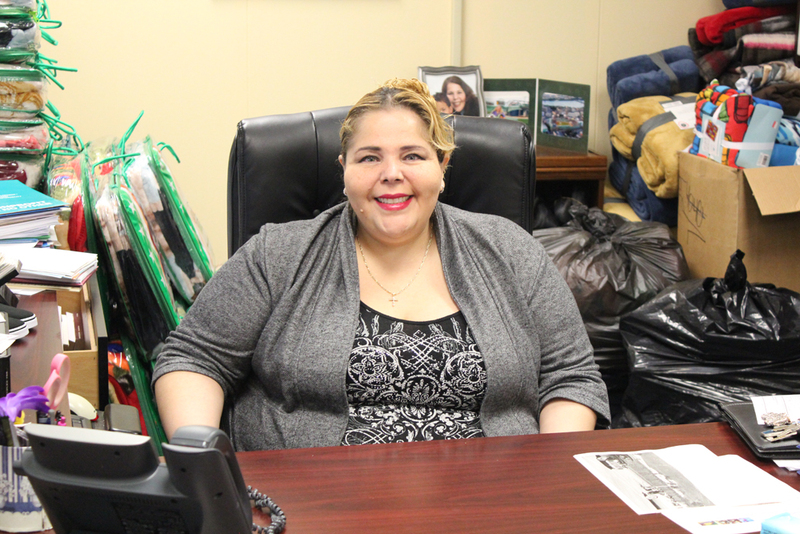 On any given day, you might see Medina driving her truck around the district, where she keeps items such as donated refrigerators, microwave ovens and mattresses to bring to families in need. San Ysidro continued to receive the grant every year until last year when the district no longer met the criteria and lost the funding. The San Ysidro School District was one of the first in the county to receive a McKinney-Vento grant back in 2006. The district’s grant writer, Mary Ann Saponara, applied and was awarded $390,000 for three years. San Ysidro continued to receive the grant every year until last year when the district no longer met the criteria and lost the funding. Medina was laid off. With students still in need, administrators quickly decided to transfer some Title I and LCAP funds to create a new position. Although Medina had to go through the interviewing process all over again, she was the top candidate thanks to her experience and got the job. Still, the current funding for homeless students is significantly less than what it used to be. She says she probably won’t be able to pass out the $10,000 worth of uniforms anymore. The Principal called her father, who picked her up and she was told that since she lived in Mexico, she couldn’t come back to school. Furious, her grandmother stomped over to the middle school and told the Principal that Medina had lived in San Ysidro all her life. The Principal didn’t believe her. Medina started living permanently with her grandmother when she began attending Montgomery High School. Focusing on academics, however, was often a challenge. She couldn’t afford school supplies and remembers getting into trouble because she didn’t have paper or pencils. Medina says her grandmother’s strict household rules is the reason why she remained on a straight-and-narrow path. She graduated from SDSU and soon thereafter was hired as a teacher’s assistant in San Ysidro. When Medina was about twenty-five, her mother cleaned up. They now have a good relationship. Medina’s own story makes her want to give all her San Ysidro families a leg up. She recalls how a mother with six kids had traveled down from Washington after the father had been killed working on the freeways. The mother had family in Mexico, so she came to San Ysidro where she hoped her children could still attend an English-language school. She found out that if she lived with relatives in Tijuana, her children couldn’t enroll, even though they were U.S. citizens. She ended up living and sleeping with her six children in her Suburban. It just so happened that while using the bathroom in the morning at a fast food restaurant, one of the employees told her to go see Medina. Thanks to the McKinney-Vento Law, the definition of a homeless student includes more than just kids sleeping on the streets. Medina explains that homeless students are those who have been abandoned by their parents and are staying with extended family members, children who live in motels or abandoned trailers, and children who live in ‘doubled up’ housing. …homeless students are those who have been abandoned by their parents and are staying with extended family members, children who live in motels or abandoned trailers, and children who live in ‘doubled up’ housing. Medina takes me on a driving tour in her truck, showing me where her students live and the challenges they face: in particular, eviction. San Ysidro has a high number of motels, approximately fifteen, where many homeless families live. With the high cost of rents in the area—a one bedroom averages $1,100 per month—living in a motel for months or even years is often cheaper. Medina knows of twelve families staying permanently at one of the San Ysidro motels. She next takes me to a trailer park across the street from Willow Elementary where about fifty to sixty students live. She recalls that about four years ago the city closed down the park because the trailers were not up to city codes, including having expired registrations. The city wanted to find housing for the families, but when they found out that half didn’t have documentation, they didn’t qualify for the housing programs. Other trailer parks are hidden away in back alleys. Accommodations might be tight, but often parents don’t want to fill out the McKinney-Vento form because they don’t want to be classified as homeless. Once Medina explains that they can receive services, they are more willing. Located on the Otay Mesa hill where a large number of auto salvage & storage lots contain run down trailers, a few homeless families have found a way to rent them. The roads are unpaved and the trailers often don’t have running water or electricity. Families might use the nearby trucker station to take showers. 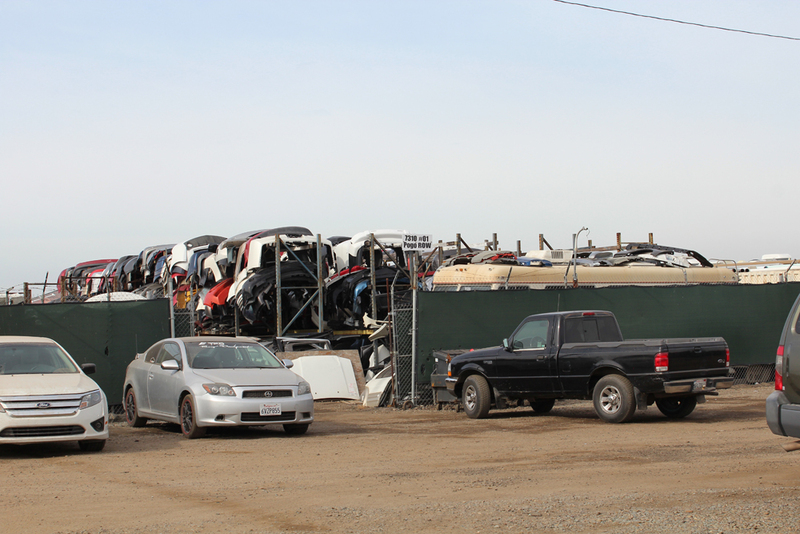 Families who live in the junkyards, however, aren’t eligible. Located on the Otay Mesa hill where a large number of auto salvage & storage lots contain run down trailers, a few homeless families have found a way to rent them. The roads are unpaved and the trailers often don’t have running water or electricity. Families might use the nearby trucker station to take showers. At the beginning of every school year, students must provide two bills that establish proof of residency. If they show a bill that is not in their name, they not only need to fill out a Declaration of Residency & Responsibility, but also a McKinney-Vento form. Medina is then called to make a home visit. She must verify that the student lives in the housing unit. If they’re doubled up, the owner of the house needs to come in and sign documentation. Medina explains that along with tight housing conditions, San Ysidro lacks a shelter. The non-profit organization Casa Familiar offers one transitional 3-bedroom apartment for families who can use the unit for up to three months to stabilize themselves without paying rent. However, the unit has a long waiting list. In 2012 Casa Familiar had a vision to create two affordable housing complexes: Los Abuelitos, a 23-unit building that would serve seniors who are primary caretakers for their grandchildren, and ‘Living Rooms at the Border,’ a 10-unit building with flexible sizes from studios to four bedrooms. Casa Familiar secured a grant from a New York non-profit called Parc Foundation, which would match any money given by the city one-to-one. When Casa Familiar presented the $3 million project to the City of San Diego’s Housing Commission, they wouldn’t approve the $1.5 million funding necessary, saying it was too expensive. If you would like to donate to the San Ysidro homeless, contact the San Ysidro School District and ask for Veronica Medina. They are always in need of school uniforms. Back to school starts in July when she runs a free backpack event as well. Thank you, Barbara, for this excellent reporting. The city and the county need to know about these homeless children. As Jeeni Criscenzo has pointed out, there are thousands of homeless children in San Diego County, many more than the 8000 or so homeless people sleeping under freeway overpasses and counted by the Point In Time count. At the same time there are millions of dollars sitting unused in various city accounts that could be tapped to build public housing. The authorities just want to stick their heads in the sand and play ostrich. They don’t want to know about it. They’re more interested in building football stadiums with skyboxes that the average person will not be able to afford. Thanks, John. Your comments are extremely valuable. I’ve been following your fantastic articles about homelessness in other parts of San Diego. Each neighborhood within San Diego County seems to present itself with different kinds of issues when tackling homelessness. In terms of San Ysidro, the area is cut off from the City of San Diego by Chula Vista — and yet, they are part of San Diego. As a consequence, people here often feel that they’ve been forgotten. In terms of the homeless, there is not one shelter here. There are also an unusually large number of motels. In addition, if you go out to Otay Mesa, there’s plenty of land…. where, for example, affordable housing could be built. Just wanted to say I agree with you completely – the situation is terrible. Barbara, thank you for the great article, I will be contacting Veronica to see what I can do to help. Thank you for shining a light on the challenges our students face.